Justly one of the most famous Father Brown stories, “The Sign of the Broken Sword” significantly departs from Chesterton’s usual formula. The action of the story itself is a simple walk through a cold wood somewhere in the north of England, while the mystery it presents is buried deep in the past, and only emerges through a series of flashbacks—and yet the story is an extremely gripping one, centering around an innocent riddle that takes on a terrible meaning as we learn more and more of the history of the battle of the Black River. The “history” of the story, incidentally, is fictitious; Chesterton invents a war between England and Brazil, deftly sketches some of the military and political figures involved, creates a puzzling but seemingly stirring and heroic imaginary military incident—and then proceeds to give the dark “true” story behind it. 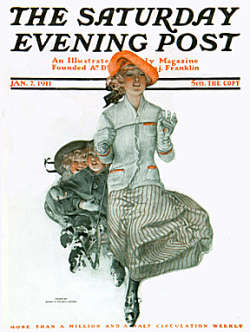 Editor’s Note: It was a common editorial practice of The Saturday Evening Post to place an illustration just below the title of the story. Since these illustrations usually portrayed incidents from later in the story, we have taken the liberty of moving these illustrations next to the actions they portray. THE THOUSAND ARMS of the forest were gray, and its million fingers silver. In a sky of dark green-blue, like slate, the stars were bleak and brilliant like splintered ice. All that thickly-wooded and sparsely-tenanted countryside was stiff with a bitter and brittle frost. The black hollows between the trunks of the trees looked like bottomless black caverns of that Scandinavian hell—a hell of incalculable cold. Even the square stone tower of the church looked northern to the point of heathenry, as if it were some barbaric tower among the sea rocks of Iceland. It was a queer night for anyone to explore a churchyard. But, on the other hand, it was a queer churchyard and, perhaps, was worth exploring. It rose abruptly out of the ashen wastes of forest in a sort of hump, or shoulder, of green turf that looked gray in the starlight. Most of the graves were on a slant, and the path leading up to the church was as steep as a staircase. On the top of the hill, in the one flat and prominent place, was the monument for which the place was famous. It contrasted strangely with the featureless graves all around; for it was the work of one of the greatest sculptors of modern Europe. And yet his fame was at once forgotten in the fame of the man whose image he had made. It showed, by touches of the small silver pencil of starlight, the massive metal figure of a soldier recumbent, the strong hands sealed in an everlasting worship, the great head pillowed upon a gun. The venerable face was bearded, or rather whiskered, in the old, heavy Colonel Newcome fashion. The uniform, though suggested with the few strokes of simplicity, was that of modern war. By his right side lay a sword, of which the tip was broken off; on the left side lay a Bible. On glowing summer afternoons came wagonets full of Americans and cultured suburbans to see the sepulcher; but even then they felt the vast forest land with its one dumpy dome of churchyard and church as a place oddly dumb and neglected. In this freezing darkness of midwinter one would think he might be left alone with the stars. 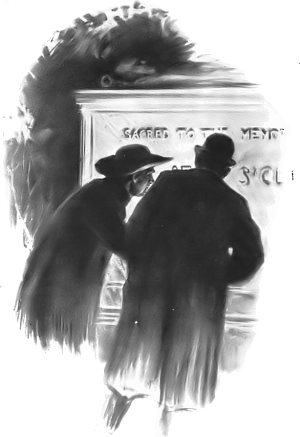 Nevertheless, in the stillness of those stiff woods an iron latch rasped and a wooden gate creaked, and two dim figures, dressed in black, climbed up the little path to the tomb. Sacred to the Memory of General Sir Arthur St. Clare, Hero and Martyr, who Always Vanquished His Enemies and Always Spared Them, and Was Treacherously Slain by Them at Last. May God in Whom He Trusted Both Reward and Revenge Him. “And that popular story is untrue?” suggested Flambeau. “Go on,” said the large man impatiently, as the other bit his finger again. A LARGE, FROZEN MOON, like a lustrous snowball, began to show through the tangle of twigs in front of them and by its light the narrator had been able to refresh his memory of Captain Keith’s text from a scrap of printed paper. As he folded it up and put it back in his pocket Flambeau threw up his hand with a French gesture. He strode on, breathing hard, his black head and bull neck forward, like a man winning a walking race. The little priest, amused and interested, had some trouble in trotting beside him. Just before them the trees fell back a little to left and right and the road swept downwards across a clear, moonlit valley, till it dived again like a rabbit into the wall of another wood. The entrance to the farther forest looked small and round like the black hole of a remote railway tunnel. But it was within some hundred yards and gaped like a cavern before Flambeau spoke again. He stared firmly at the gray façade of forest in front of him, with the one black gap in it, like the mouth of the grave, into which their path plunged. Perhaps something menacing in the road, thus suddenly swallowed, reinforced his vivid vision of the tragedy, for he shuddered. “A horrid story,” he said. Flambeau looked up wildly at the moon thus invoked, and from where he stood one black tree-bough curved across it exactly like a devil’s horn. “Worse than that,” said the priest like an echo. And they plunged into the black cloister of the woodland, which ran by them in a dim tapestry of trunks, like one of the dark corridors in a dream. “Only a month or two ago a certain Brazilian official died in England, having quarreled with Olivier and left his country. He was a well-known figure, both here and on the continent, a Spaniard named Espado. I knew him myself, a yellow-faced old dandy, with a hooked nose. 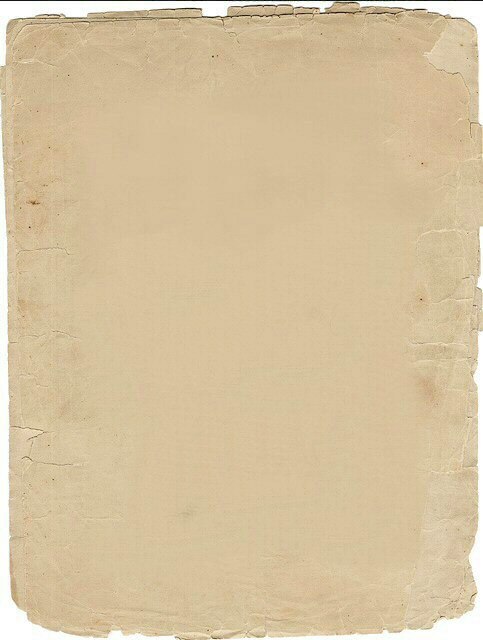 For various private reasons I had permission to see the documents he had left. He was a Catholic, of course, and I had been with him towards the end. There was nothing of his that lit up any corner of the black St. Clare business except five or six common exercise books filled with the diary of some English soldier. I can only suppose that it was found by the Brazilians on one of those that fell. Anyhow, it stopped abruptly the night before the battle. “But the account of that last day in the poor fellow’s life was certainly worth reading. I have it on me, but it’s too dark to read it here and I will give you a résumé. The first part of that entry is full of jokes, evidently flung about among the men, about somebody called the Vulture. It does not seem as if this person, whoever he was, was one of themselves, nor even an Englishman. Neither is he exactly spoken of as one of the enemy. It sounds rather as if he were some local go-between and non-combatant—perhaps a guide or a journalist. He has been closeted with old Colonel Clancy, but is more often seen talking to the major. Indeed, the major is somewhat prominent in this soldier’s narrative: a lean, dark-haired man, apparently, of the name of Murray. A North of Ireland man and a Puritan. There are continual jests about the contrast between this Ulsterman’s austerity and the conviviality of Colonel Clancy. There is also some joke about the Vulture wearing bright-colored clothes. “But all these levities are scattered by what may well be called the note of a trumpet. Behind the English camp and almost parallel to the river ran one of the few great roads of that district. Westward the road curved round towards the river, which it crossed by the bridge before mentioned. To the east the road swept backward into the wilds, and some two miles along it was the next English outpost. From this direction there came along the road, that evening, a glitter and clatter of light cavalry in which even the simple diarist could recognize with astonishment the general with his staff. He rode the great white horse which you have seen so often in illustrated papers and academy pictures, and you may be sure that the salute they gave him was not merely ceremonial. He, at least, wasted no time on ceremony but, springing from the saddle, immediately mixed with the group of officers and fell into emphatic though confidential speech. What struck our friend, the diarist, most was his special disposition to discuss matters with Major Murray; but, indeed, such a selection, so long as it was not marked, was in no way unnatural. The two men were made for sympathy. They were men who read their Bibles; they were both the old Evangelical type of officer. 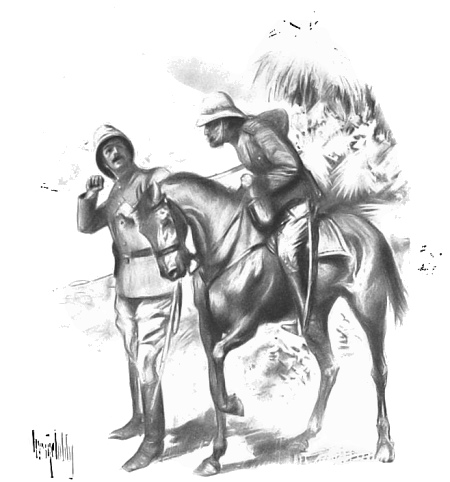 However this may be, it is certain that when the general mounted again he was still talking earnestly to Murray, and that as he walked his horse slowly down the road towards the river, the tall Ulsterman still walked by his bridle-rein in earnest debate. The soldiers watched the two until they vanished behind a clump of trees where the road turned toward the river. The colonel had gone back to his tent and the men to their pickets. The man with the diary lingered for four minutes and saw a marvelous sight. “The great white horse which had marched slowly down the road, as it had marched in so many processions, flew back, galloping up the road toward them as if it were mad to win a race. At first they thought it had run away with the man on its back, but they soon saw that the general, a fine rider, was himself urging it to full speed. 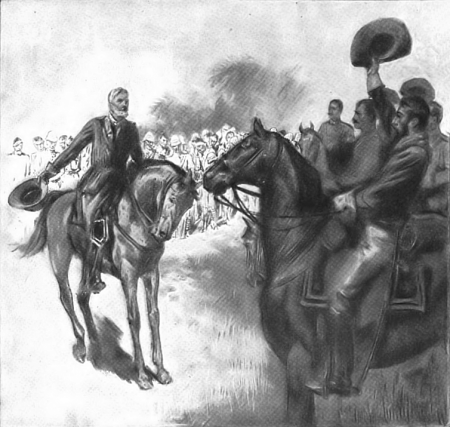 Horse and man swept up to them like a whirlwind, and then, reining up the reeling charger, the general turned on them a face like a flame and called for the colonel like the trumpet that wakes the dead. Father Brown had mounted ahead, for the woodland path grew smaller, steeper and more twisted, till they felt as if they were ascending a winding staircase. The priest’s voice came from above out of the darkness. “What do you mean?” cried the other, and stood still under the stars. They had come abruptly out of the gray gates of the wood. “Sir Arthur St. Clare, as I have already said, was a man who read his Bible. That was what was the matter with him. When will people understand that it is useless for a man to read his Bible unless he also reads everybody else’s Bible? A printer reads a Bible for misprints. A Mormon reads his Bible and finds polygamy; a Christian Scientist reads his, and finds we have no arms and legs. St. Clare was an old Anglo-Indian Protestant soldier. Now, just think what that might mean, and for Heaven’s sake, don’t cant about it. It might mean a man, physically formidable, living under a tropic sun in an Oriental society, and soaking himself, without sense or guidance, in an Oriental book. Of course, he read the Old Testament rather than the New. Of course, he found in the Old Testament anything that he wanted—lust, tyranny, treason. Oh, I dare say he was honest, as you call it. But what is the good of a man being honest in his worship of dishonesty? “What do you mean?” asked his friend again. “The traitors,” said Flambeau, and shuddered. As he looked around at the inhuman landscape of trees with taunting and almost obscene outlines, he could almost fancy he was Dante, and the priest with the rivulet of a voice was, indeed, a Vergil, leading him through a land of eternal sins. The wintry road curved over a ridge in cutting frost, with cruel black shapes of bush and thicket, but Flambeau fancied that he saw beyond it faintly the edge of an aureole that was not starlight and moonlight, but some fire such as is made by men. He watched it as the tale drew to its close. THE WARMER GLOW behind the black winter wood grew richer and brighter, and Flambeau strode on to reach it. Father Brown also quickened his stride, but he seemed merely absorbed in his tale. “But what about Olivier and the hanging?” asked Flambeau. “Everybody but the general,” said the tall man. Flambeau knitted his black brows. “I don’t grasp it all yet,” he said. AS THE TWO topped the ridge there burst on them the strong, scarlet light of a red-curtained English inn. It stood sideways in the road, as if standing aside in the amplitude of hospitality. Its three doors stood open with invitation, and even where they stood they could hear the hum and laughter of humanity happy for a night. “With all my heart,” said Flambeau, and was just striding into the bright, noisy bar when he stepped back and almost fell on the road. 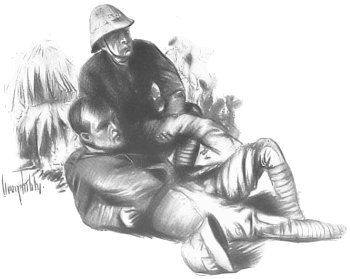 “I thought we had done with the leper,” cried Flambeau, and spat on the road. A careful search of copyright records has shown that this story is in the Public Domain. Did you enjoy your visit to Famous (and forgotten) Fiction ? Please consider subscribing, to help pay our web hosting and keep us writing! Plus, you get your name listed on our Editors' Corner page. For site questions, please contact us through the Editors' Corner.